We’re one step closer to being able to regrow a lost tooth, thanks to a new study showing it’s possible to grow multiple teeth from a single root. These teeth can then be implanted to become fully functional. Thus far it has only been tested in rats, but it could lead to a potential revolution in human dental care. When the body begins to develop teeth, the epithelium (skin) dips inwards into the mesenchymal region — an area filled with unaffiliated cells that can develop into many different things, including arteries, ligaments, and bone. In this case, it develops into a “tooth germ,” a little bud that sends out waves of signals, in the form of signaling proteins, which will cause the cells to develop into a functioning tooth. These signaling waves do not happen correctly for everyone. Plenty of people are born a tooth short, and many more lose teeth over the course of their lives. That’s why the latest results of research conducted by Tokyo Medical and Dental University and the RIKEN Center for Developmental Biology is so exciting. They removed these tooth germs from developing mice, and kept the germs alive. At different points during the germs’ development, the researchers took a little nylon thread, looped it around the bud, and split it in two. The bud could stop growing, or it could grow into something functionally useless. If the germ was split at 14.5 days of development, they found that each germ developed its own signaling center, which sent out waves of signaling molecules and allowed each tooth to develop. 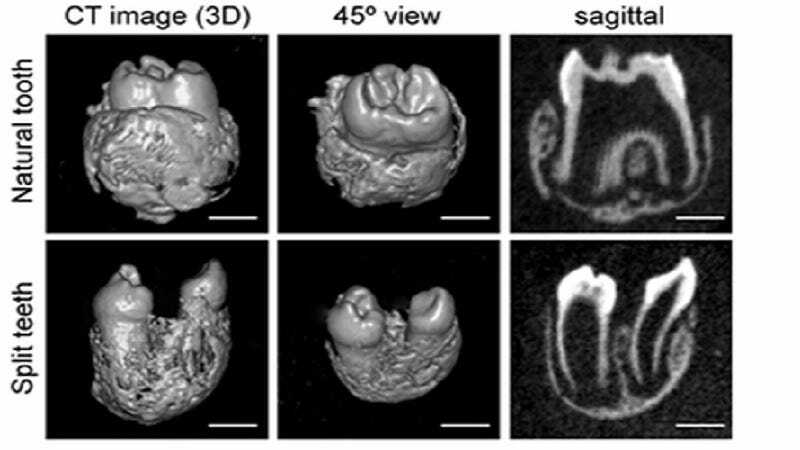 When the researchers transplanted the developing germs into the jaws of mice, the teeth came in and “restored physiological tooth functions, including mastication, periodontal ligament function and appropriate responses to noxious stimuli.” Noxious stimuli is any stimulus that could cause damage—even if it does not actually cause any damage. In other words, if you scraped or poked the teeth, or the rat bit into something hard with the teeth, it would react just the way rats with natural teeth did. So one day, we might be able to go through “teething” as adult.